Romford is a market town and the Romford market once depended on the stamina of sheep, but in the 13th century, the distance they could walk in a day was a crucial factor in deciding whether Romford was entitled to hold a market. Therefore two leagues, or six and two third miles, were reckoned to be the maximum distance of a one-day sheep drive. Since there was no other market within that distance, King Henry III (1242-1247) granted Romford permission to hold one every Wednesday as an outlet for the Hornchurch leather trade. 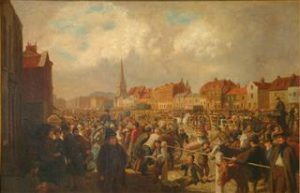 The market was established in 1247. That six and two third mile marker remains the minimum distance between markets. It is the legal bedrock on which Romford has successfully fought off the setting up of other markets nearby. There has been a church on the Romford marketplace since 1410. The earliest church, or rather chapel of Romford, was in what is still known as the Oldchurch area and was first mentioned in 1177. Built near the River Rom then called Mercke-dych, it became too ruinous to use towards the end of the 14th century and the new church was built. The present Anglican church was built in 1849-50 on the site of the 15th century building. It was dedicated to the Blessed Virgin Mary and St Edward the Confessor. The architect John Johnson, in the decorated style that is a type of Gothic architecture used in this country in the middle ages designed the church. It is built mainly of Kentish Rag with Bath dressings. Some of the memorials are from the earlier church of 1410 and were transferred to the new Anglican building in 1849-50.